there are some places i know i will love writing about once i step in, and that was exactly what happened when my friends and i ventured to st john bakery in the (okay fine, not so) wee hours of the Saturday morning that just went by. despite the excitement over this gem of a find, there is an inescapable reluctance to write about it as i begin this post. some things are better kept as secrets, away from crowds and droves of tourists because that is precisely where their charm lies. but sharing is caring, yes? just promise me you won’t tell too many people. 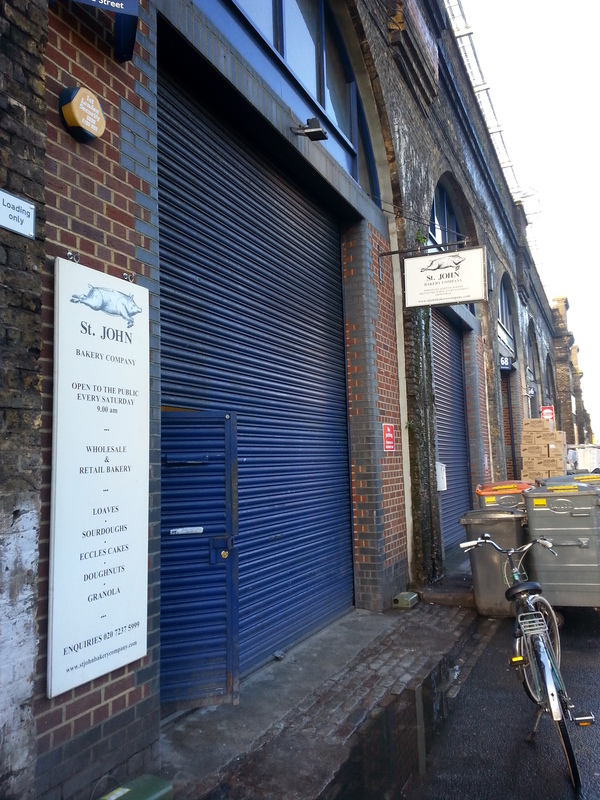 here goes..
st john bakery is located just behind the main maltby market stretch of stalls (more on this in another post to come!). 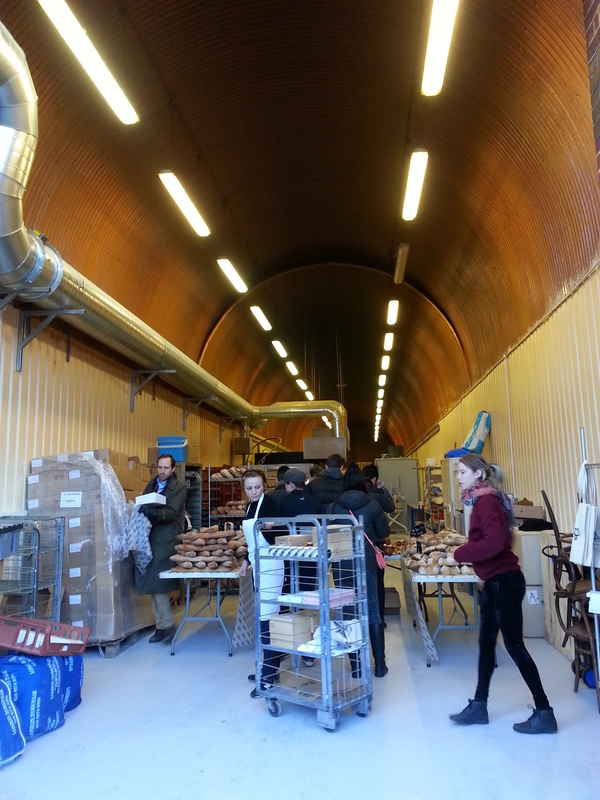 walk through a dank and dodgy-looking tunnel and you’ll find yourself along a street with blue-shuttered warehouses. at this point you’ll probably be thinking you’re at the wrong place because it really doesn’t look like there’s going to be any food there, but fear not and go forth beyond the graffitied walls! 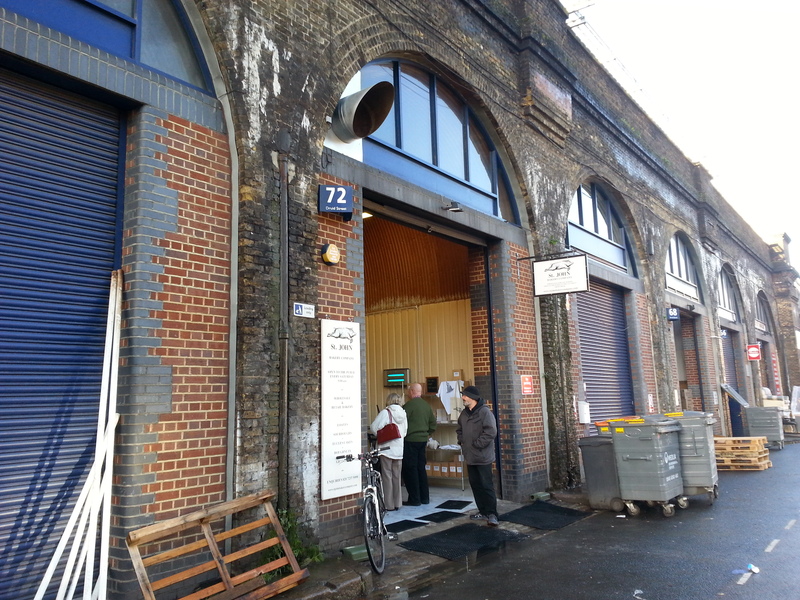 tucked under a railway arch at number 72 druid street, you will find quite possibly the best doughnuts in all of london. we had heard of the legendary doughnuts they sold on weekends there, and were told that they would sell out if we didn’t get there early enough. after a quick cost-benefit analysis, it was decided that the cost of getting up early after a late night the night before was less than the benefit of sinking my teeth into one of those decadent delights (their decadence was confirmed by pictures i had googled). 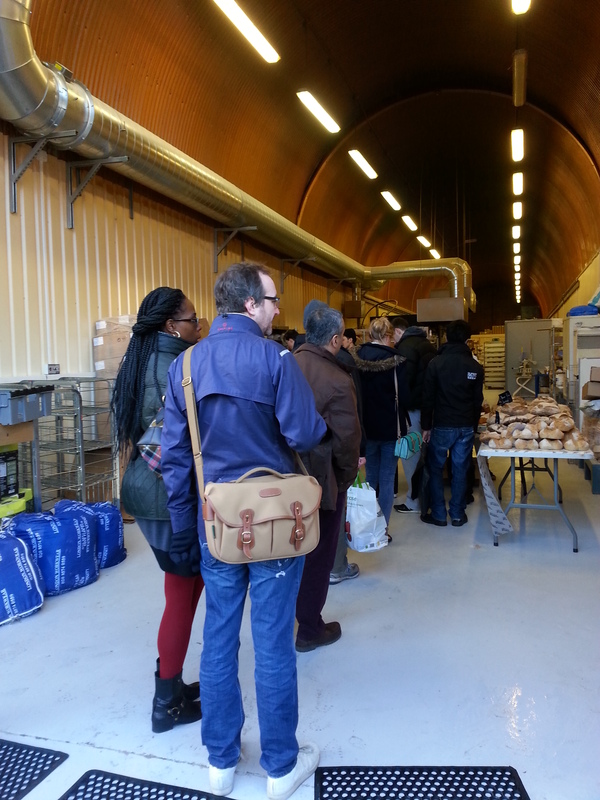 so, it was at 830am in the morning on the second day of chinese new year that we ventured towards the river and past the more “mainstream” borough market for maltby, located in bermondsey and not as accessible by the underground as we would have liked. nothing stands in the way of us and good food though, so we found our way there in good time and arrived to watch the shutters of st john going up for the day. 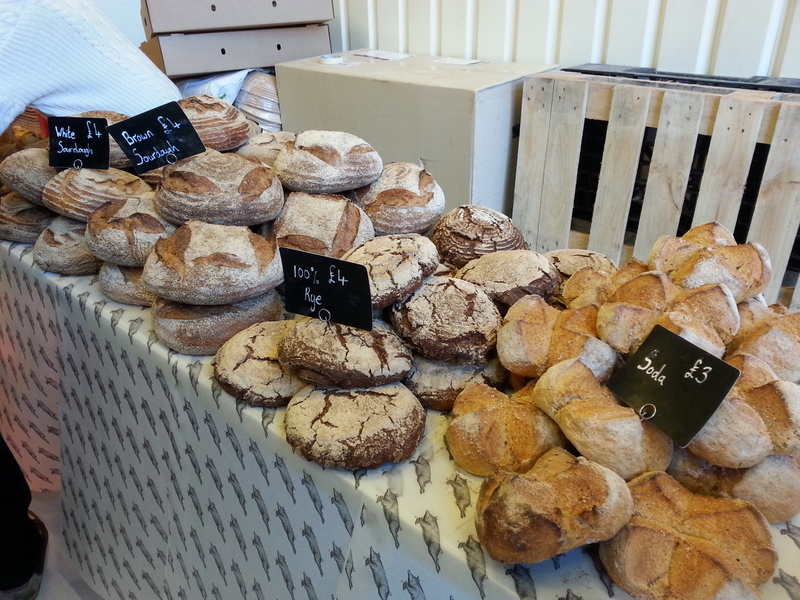 they had vanilla, chocolate and apple jam (not on display, had to ask for them!) doughnuts available on the day we visited. 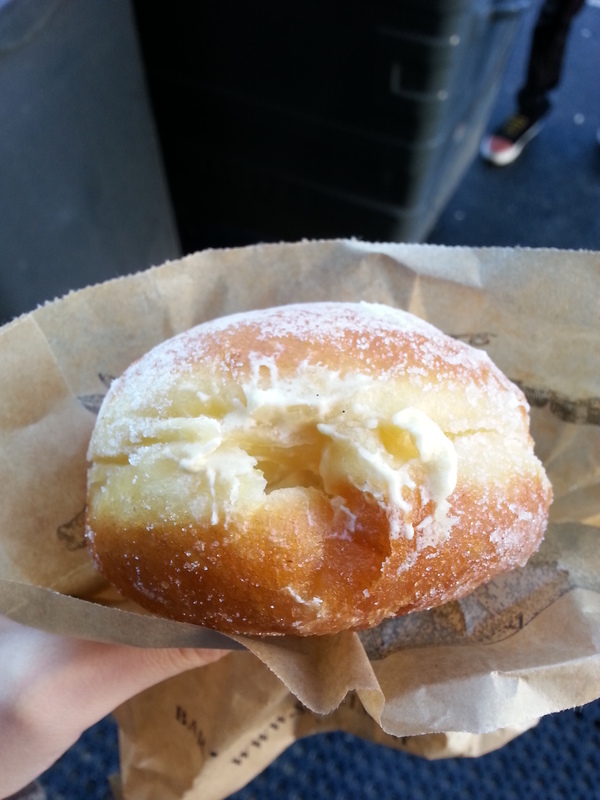 i started with the vanilla custard doughnut, which is always available (the rest change) and what they are most well-known for. 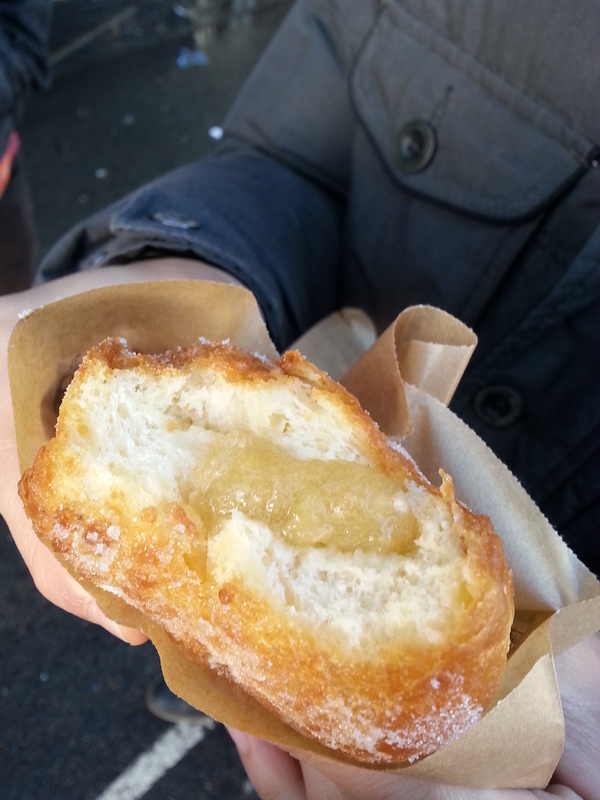 it really set the standard rather high for the rest – it was one pretty damn good doughnut. the doughnut itself is incredibly light and fluffy – it has a brioche-inspired consistency, and is dusted with just the right amount of sugar that makes it sweet as a doughnut should be, but not overly so. 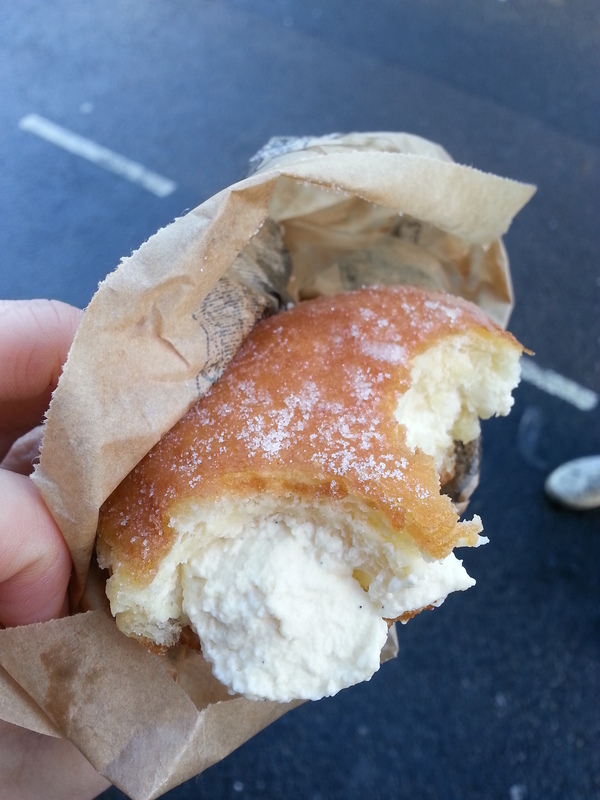 as for the custard cream, can i just say, best doughnut filling ever?! the pregnant doughnut literally explodes in your mouth when you bite into it; the vanilla custard oozes out and the vanilla-bean cream is so fresh and light you feel like you could have an entire tubful of it without feeling ill. it is creamy, smooth, and of an amazing consistency that results in it being dense but not heavy. the whole dough ball of goodness is so pillowy, light, and relatively grease-free that you almost forget its deep-fried! this is definitely dangerous – it makes you have one after another without sparing a thought for the calorie party going on in the depths of your very satisfied tummies. 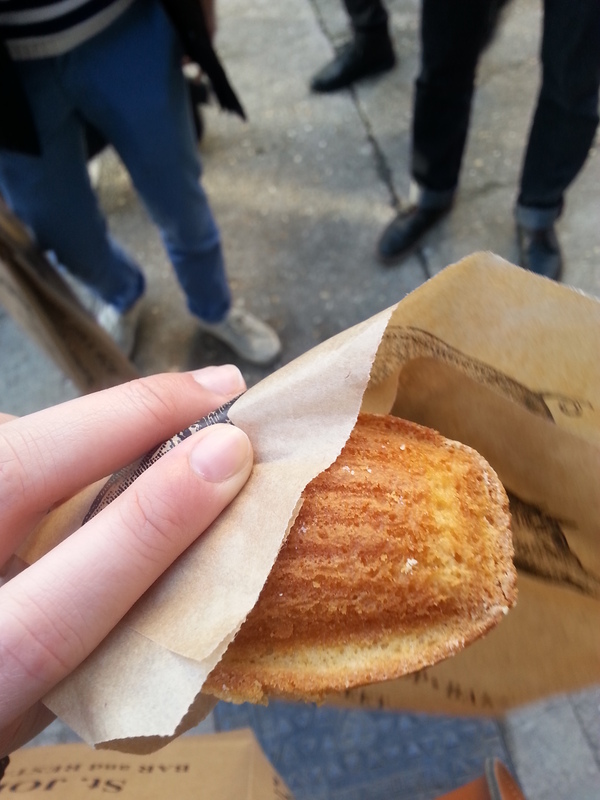 we were too busy stuffing our faces (promptly rejoined the queue for a second round after a short break) to get a picture of the chocolate cream one, but it was very very good as well. i am not a fan of chocolate, but enjoyed this nevertheless because like the vanilla custard cream, the chocolate cream was dense and satisfying yet light. also, the chocolate used was definitely of a good quality. warning: it is almost impossible to eat these glamorously. be prepared for a sticky face, but they are definitely worth the momentary lack of elegance. 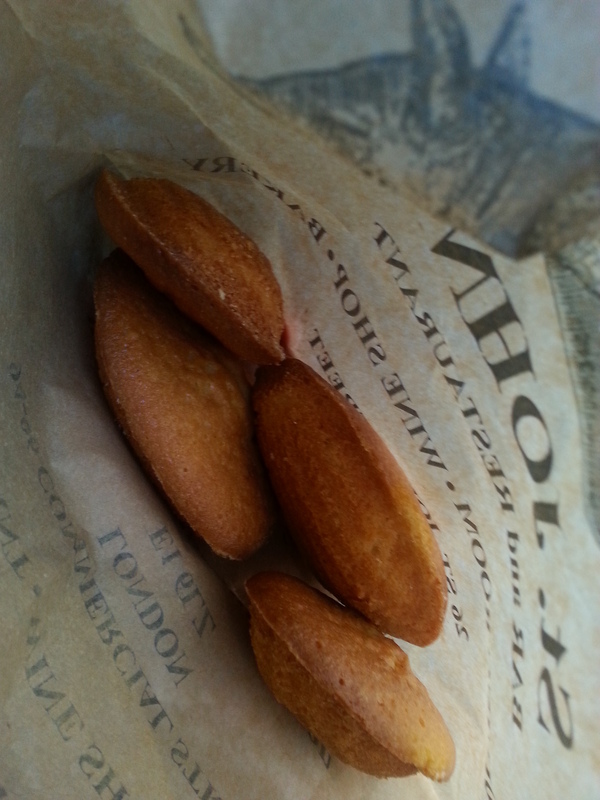 we also had a madeleine each. like the doughnuts, they were very impressive. my friend promptly declared them to be “kueh baulus on steroids” (for those who don’t know what kueh baulus are, they are malay traditional sponge cakes) and for those who don’t know what to make of that statement, don’t worry, it’s a very good thing! 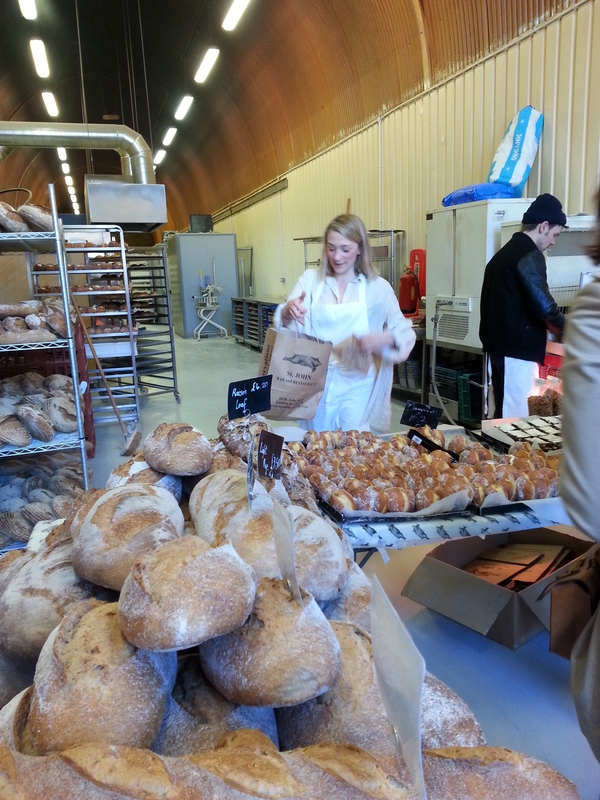 they were freshly-baked and warm, crusty on the outside but so soft and fluffy inside. at 60p each, i would have definitely gotten more if i wasn’t already stuffed from our other maltby eats (stay tuned for another post!). 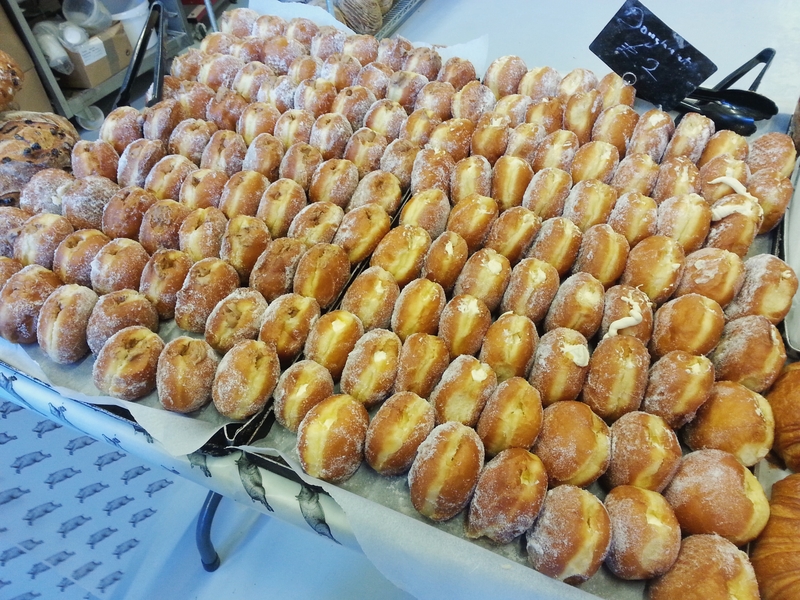 st john bakery is worth getting up early on a saturday morning for – leave your lie-in for sunday morning, and start your weekend right by getting your hands on some of these decadent to-die-for doughnuts! PS. 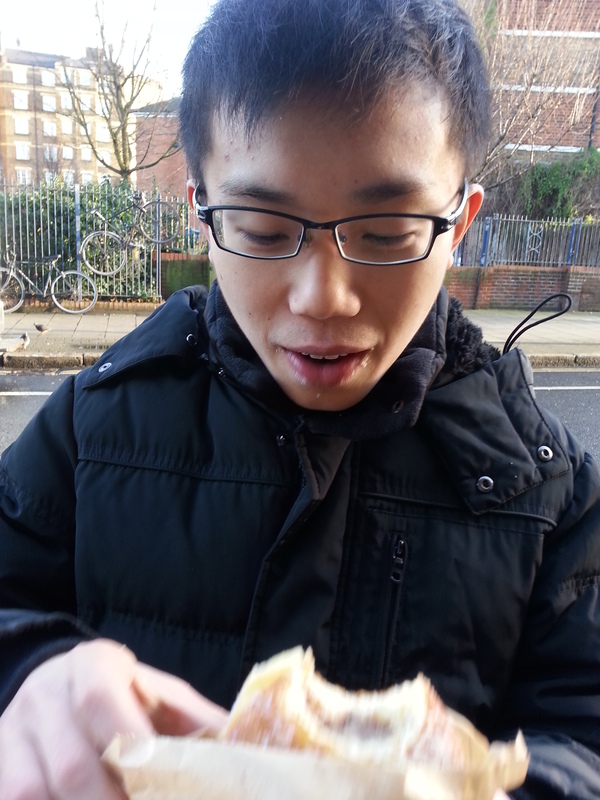 i hear they have salted caramel custard doughnuts sometimes. need. to. get. some. need. 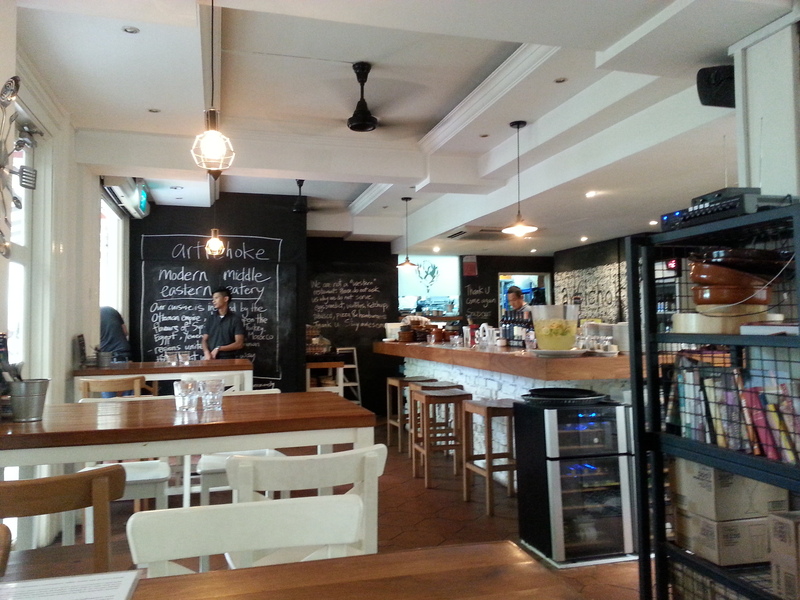 located in sculpture square (a place i think not many people even know exists), artichoke is like an oasis of calm amidst the usually bustling bugis area. 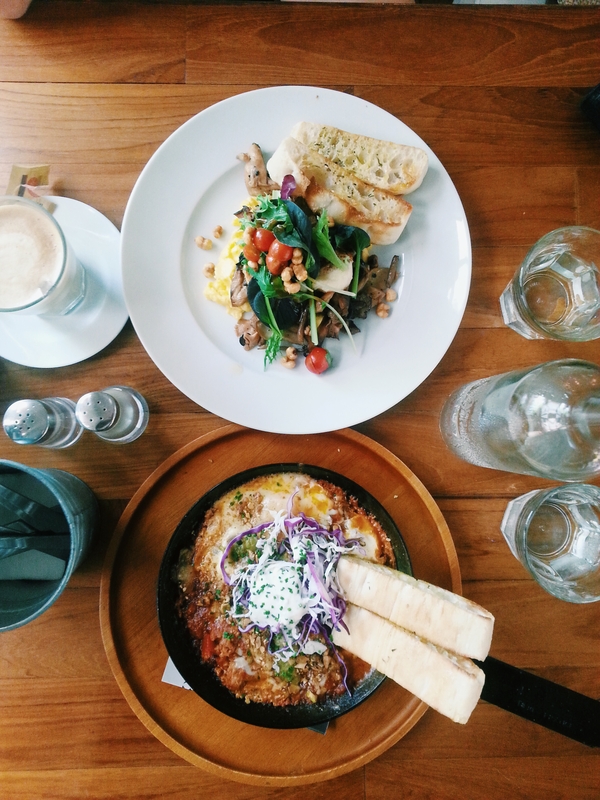 my friend and i had a great time there when we met for brunch on a saturday morning – we ended up staying for 3 whole hours having great conversation over amazing food in a nice setting. we knew how popular artichoke is, especially on weekends, so we made a reservation and managed to get a lovely raised table meant for 4, by a big window that looked out into the artichoke courtyard. yay! 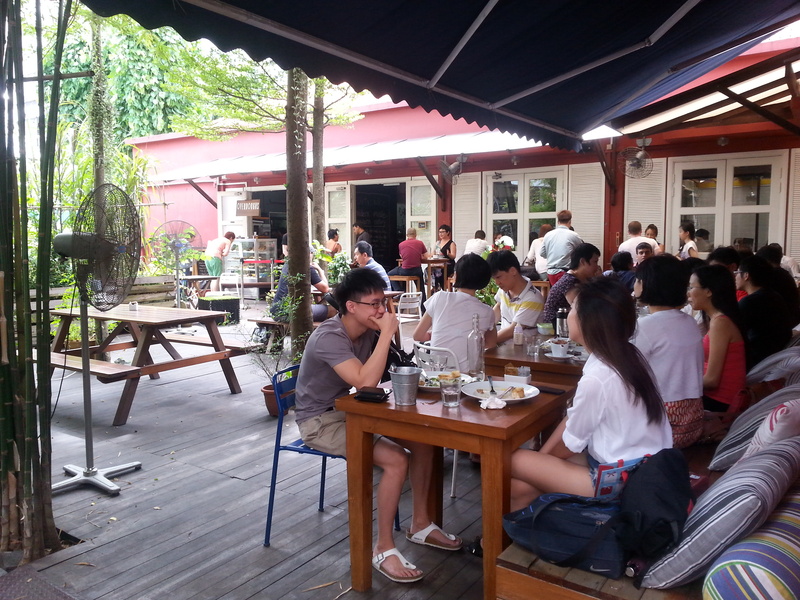 the cafe exudes a laidback yet sophisticated vibe; it is casual but not sloppy and spacious but still cosy. 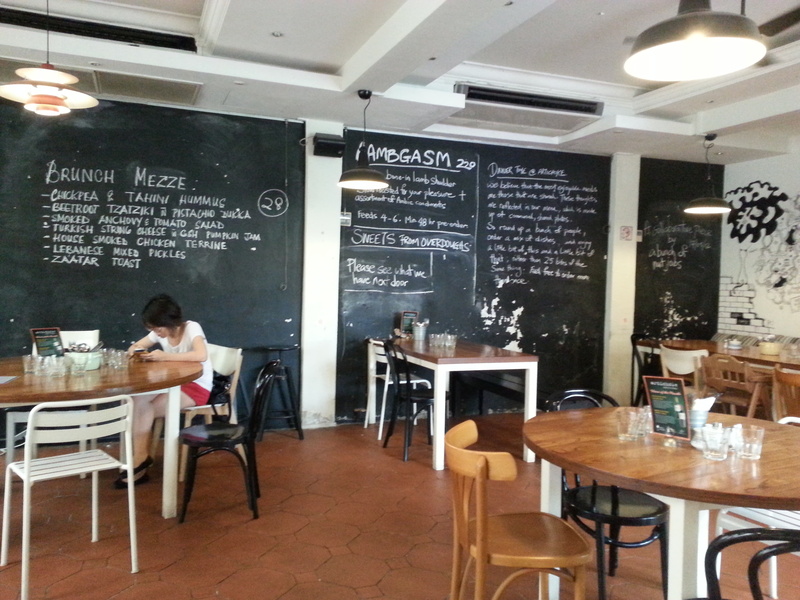 it is also bright and airy, and i love how the tables are well spread-out so that it doesn’t get too noisy and you don’t have to worry about other diners hearing your entire conversation. 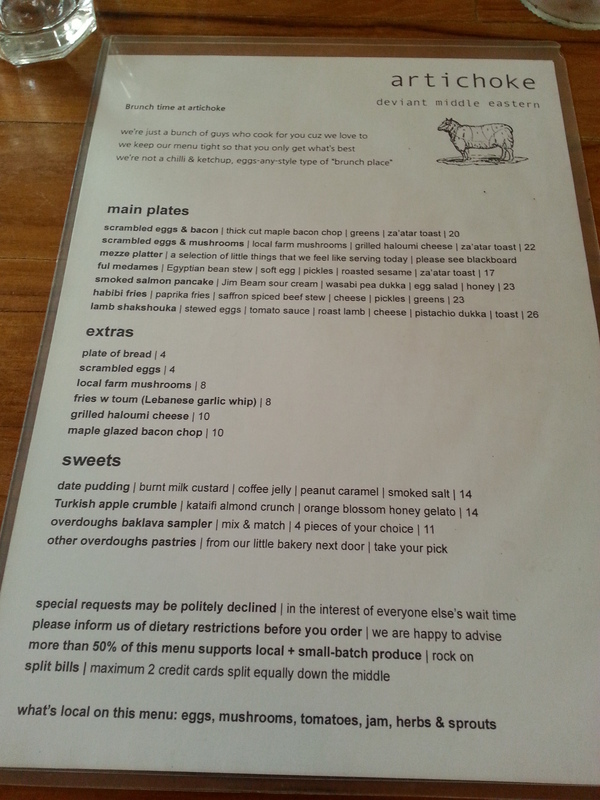 i was really excited by the menu – everything was different from the usual brunch fare available elsewhere, and had nice middle eastern/turkish/arabic touches to them. 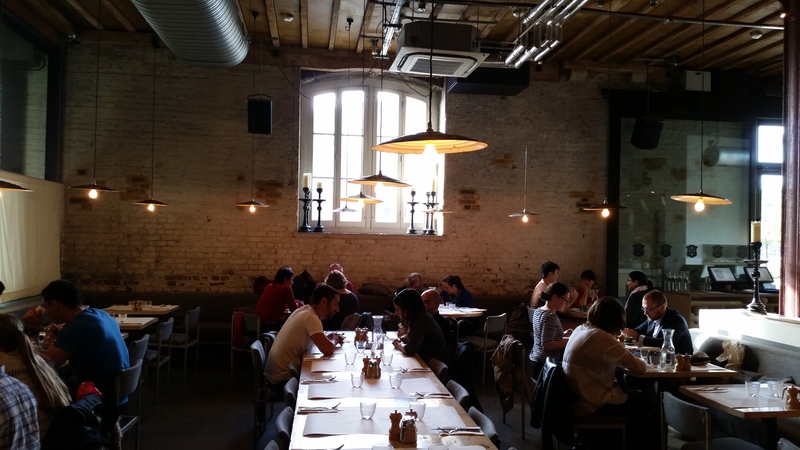 artichoke prides itself on serving moorish cuisine. not quite sure myself what exactly moorish cuisine entails, but that might be because that is exactly what it is – a cuisine that comes from a huge variety of sources and has all kinds of influences (african/spanish/middle eastern etc), with no true definition that encompasses everything under it. 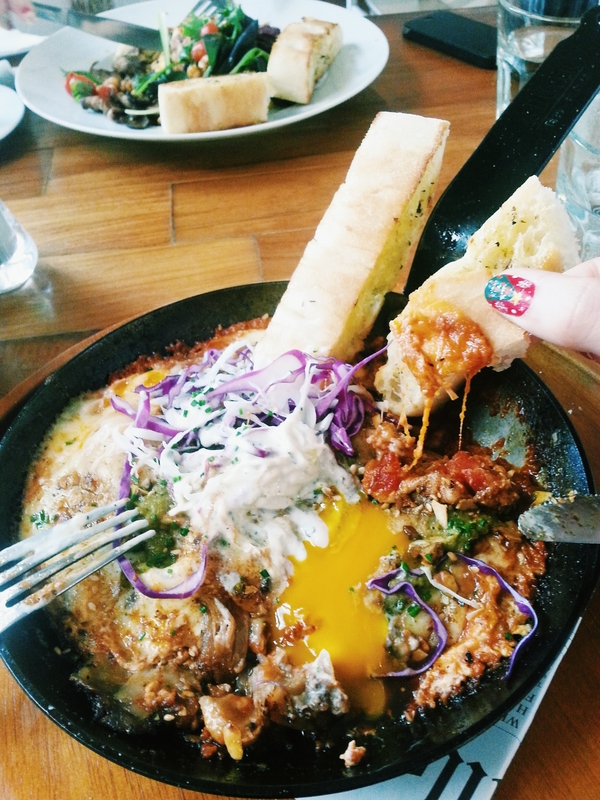 we opted for the scrambled eggs and mushrooms and the lamb shakshouka, and boy am i glad we did, because they were both amazing. this was super yummy! 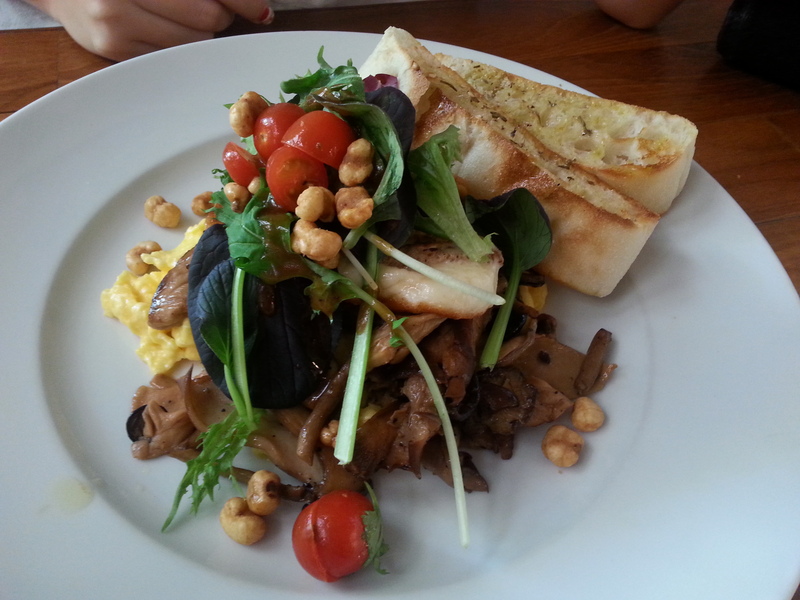 being an egg and mushroom lover, this was heaven on a plate. the mushrooms were fresh and juicy, and were cooked to finger-lickin’ perfection 😉 love how they’re local farm mushrooms too! nothing gourmet or fancy, but tasted just as delicious. as for the scrambled eggs, they were also pretty much perfect – not too wet nor dry, wonderfully creamy but not mushy at all! the eggs & mushrooms were topped with some fresh greens and these unidentifiable crispy bits (still don’t really know what they are) that were glazed in something (couldn’t really place what the glaze was either… oh dear) that were extremely delicious and added texture to the dish. 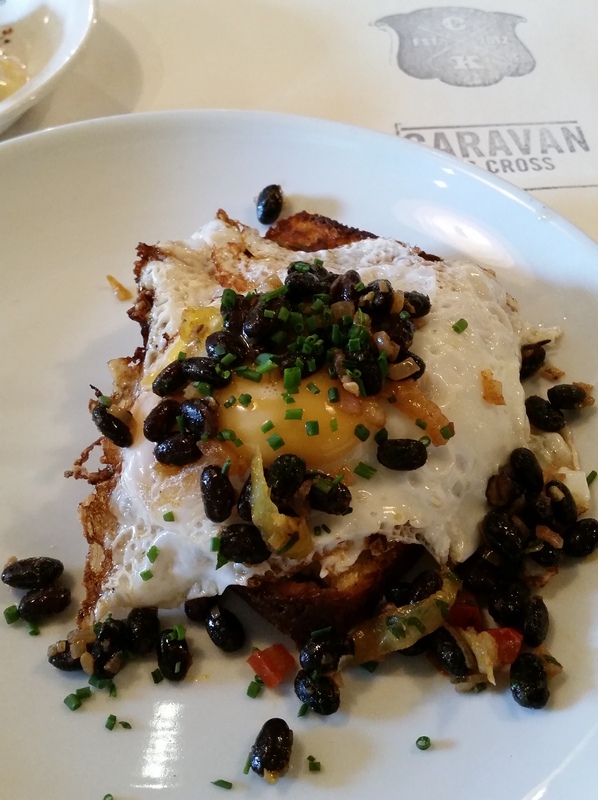 the za’atar toast was also delicious, making for a super satisfying plate of goodness. our only (tiny) complaint was that we found the grilled halloumi a tad too salty. but other than that, it was grilled well and yummy like everything else! not sure if you can see in the picture because of the lack of scale, but the serving was pretty big! definitely filling, yet light. instead of the mushrooms, an alternative is to have to have the scrambled eggs with “thick cut maple bacon chop”. when they say thick, they really do mean thick – the slice slab of bacon was about half an inch to an inch thick, and we spotted it glistening away in all its smoked glory at many tables. looked incredibly delicious but also very very sinful. best to eat in moderation! hahaha. i was really impressed with this. 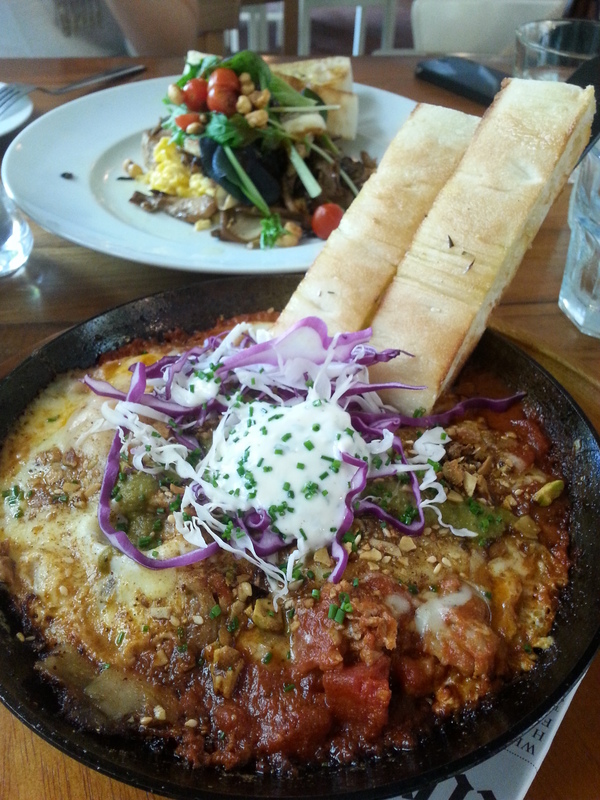 it was a pan full of bold flavours and hearty goodness. 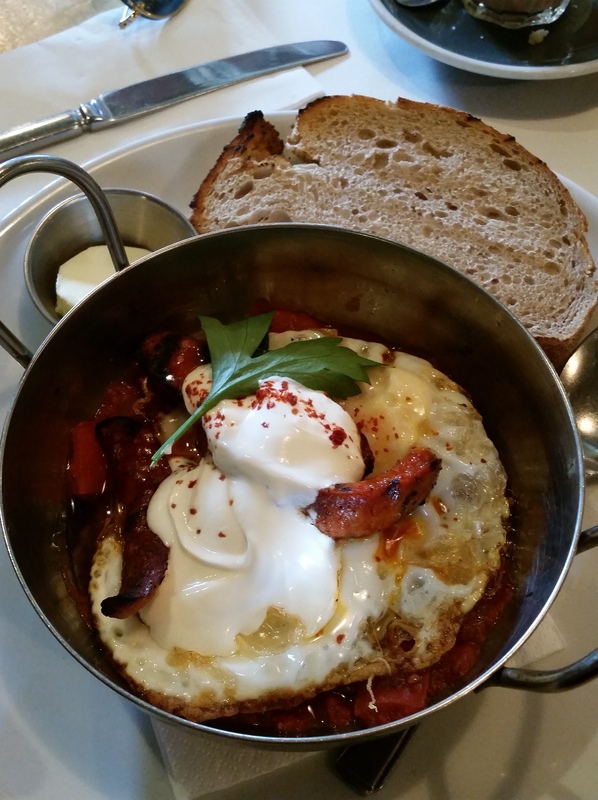 it was something like baked eggs, but even better. a giant serving of tomatoes, two runny eggs (hidden somewhere in there), amazing braised lamb shanks, cheese, topped with dukka, pistachios and some yoghurt – my idea of moorish food heaven! it was very filling, but so delicious that i just couldn’t bear to not finish it! though it sounds like a huge mess of flavours and things piled together in a pan, i must say it was a pretty organised/beautiful one 😛 the flavours and different components combined wonderfully and the lamb (which they were very generous with) was braised to perfection – it was moist, tender and extremely tasty, with none of the “smell” that people sometimes complain of when eating lamb. dunking the toast in all this was really, one of the best things ever. case in point: despite the slightly heftier price tag, i would highly recommend this to anyone dining at artichoke! the serving is big and its definitely something different from the typical brunch fare of eggs benny etc, and in my opinion, in a really good way. its pretty heavy and and can get jelat though, so best to share this and some other lighter dishes with your dining companions if you want a greater range of things to eat. it appeared at our table completely different from what we expected, and looked good enough to warrant some oohs and aahs from us and envious glances from neighbouring tables. serving was like everything else big, and the pudding itself was sitting in this deep dish of burnt milk sauce, which to me sounded very interesting but to others might sound odd, i realise. if you belong to the latter category, do not let that deter you from ordering this, because trust me, it came highly recommended and with good reason! 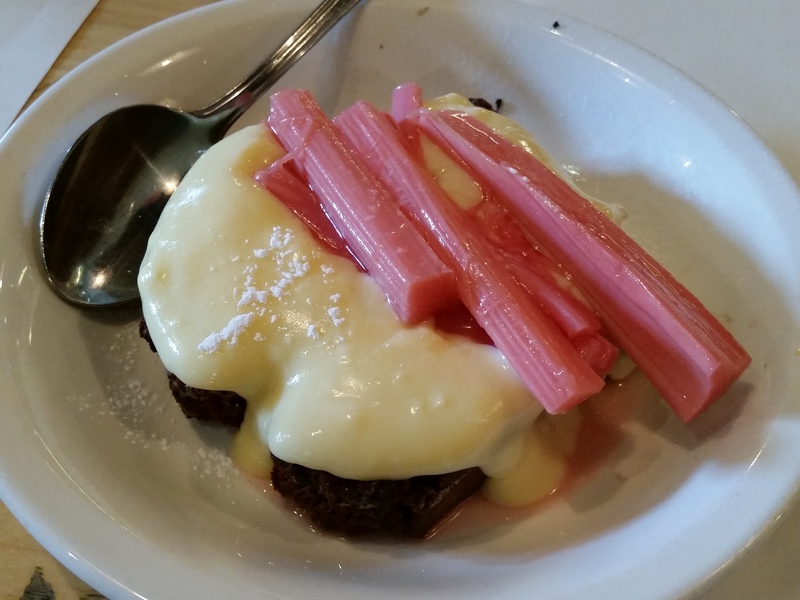 the date pudding was not cloyingly sweet like many sticky date puddings tend to be. neither was it very sticky actually! but it was moist and dense and was heavenly when eaten with the sauce surrounding it, the coffee jelly and the caramelised peanuts that topped it. the salt also added a very nice salted caramel-ish twist to the dessert. 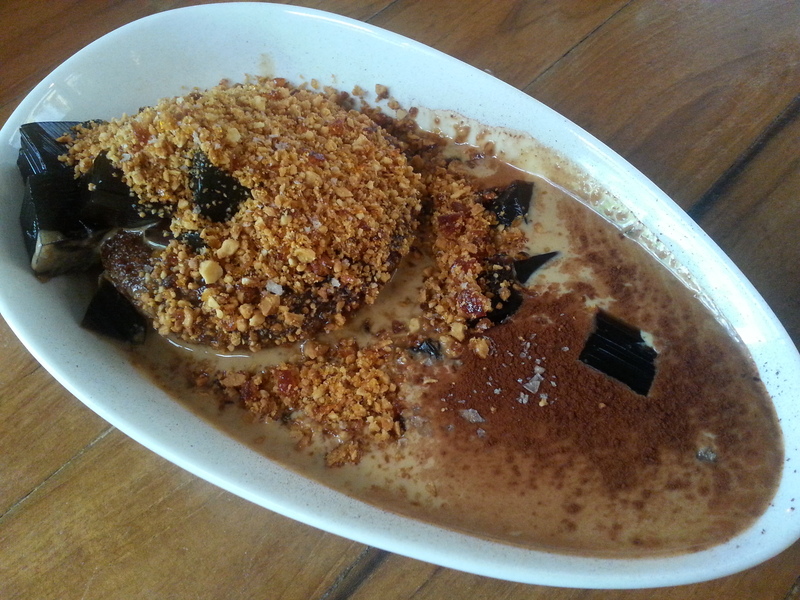 its priced rather steeply but the serving is definitely huge enough for sharing. so very satisfying! 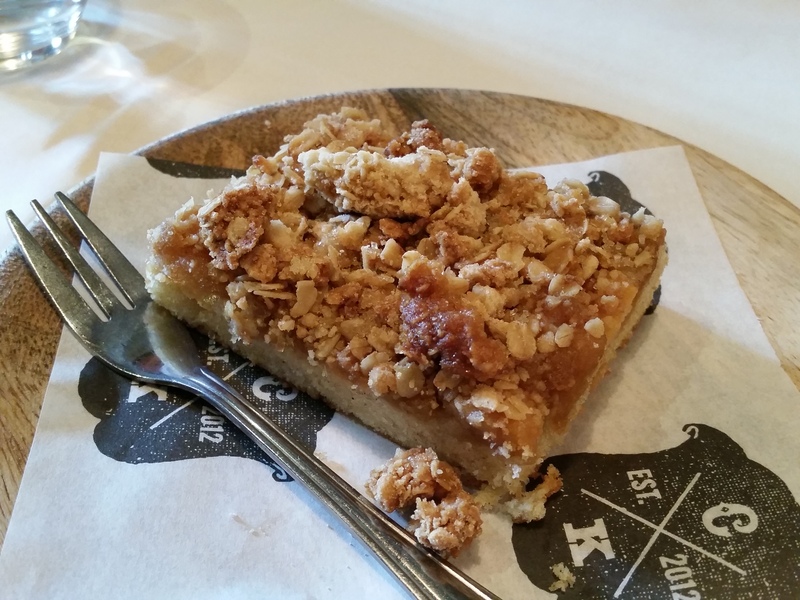 need to try the turkish apple crumble next! 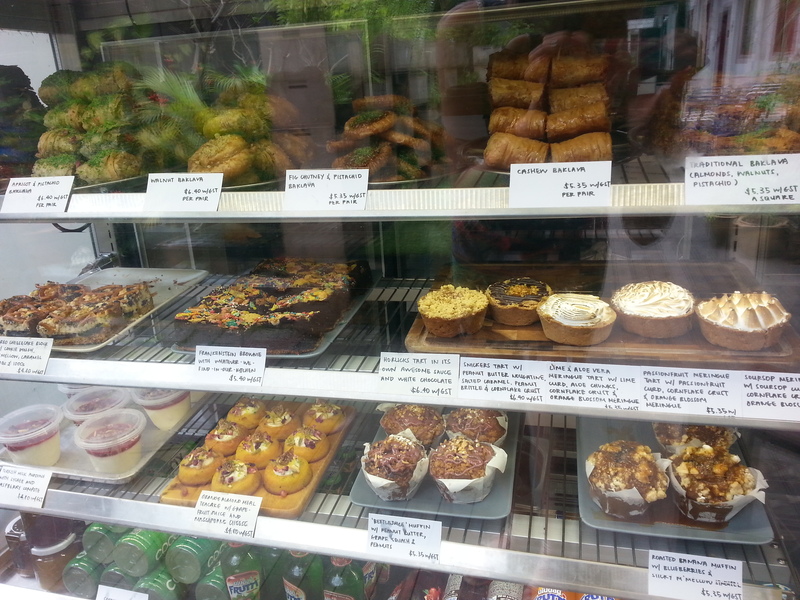 and some overdoughs delights. 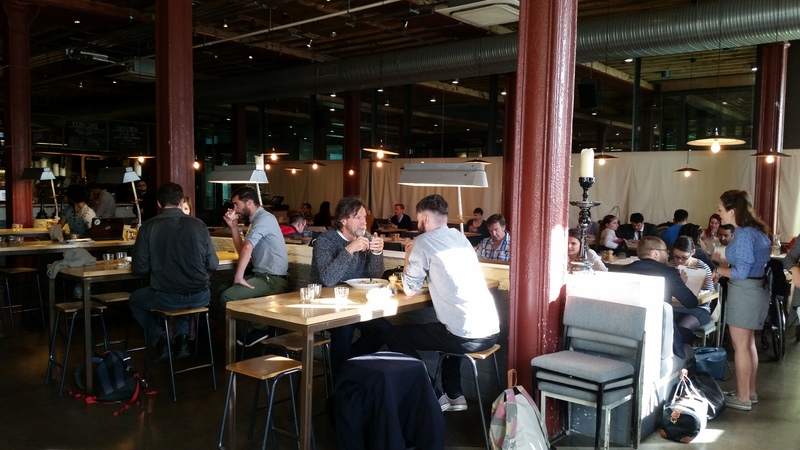 as you can tell from my pretty much rave review of artichoke, i thoroughly enjoyed it and will be back for more. i loved the ambience, the food, and the service (they give each dinner a pack of sour gummies as you leave the cafe – a nice little touch and really helps in cleansing the palette after all that delicious food!). it was quite pricey but i thought it was nevertheless pretty worth the money. 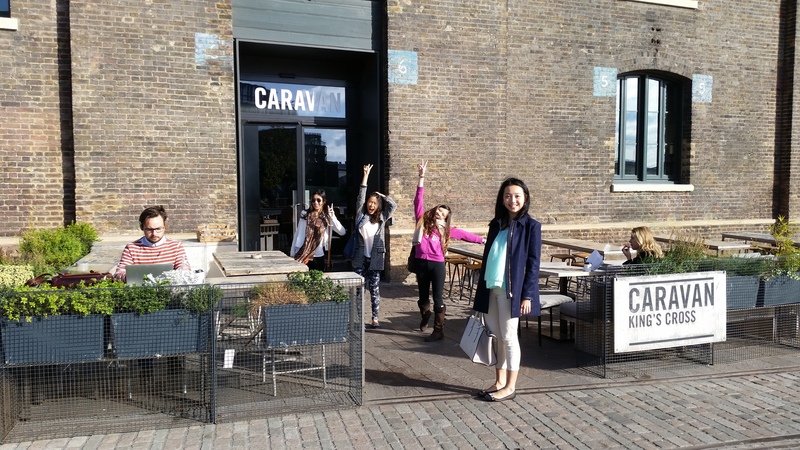 be sure to make a reservation on weekends or you might have to queue or be relegated to an outside seat (which is fine on a breezy day, but rather unoptimal on a sweltering one). i think they allow dogs in the courtyard too! saw some people dining with their furry friends so that’s something worth noting for dog owners out there. 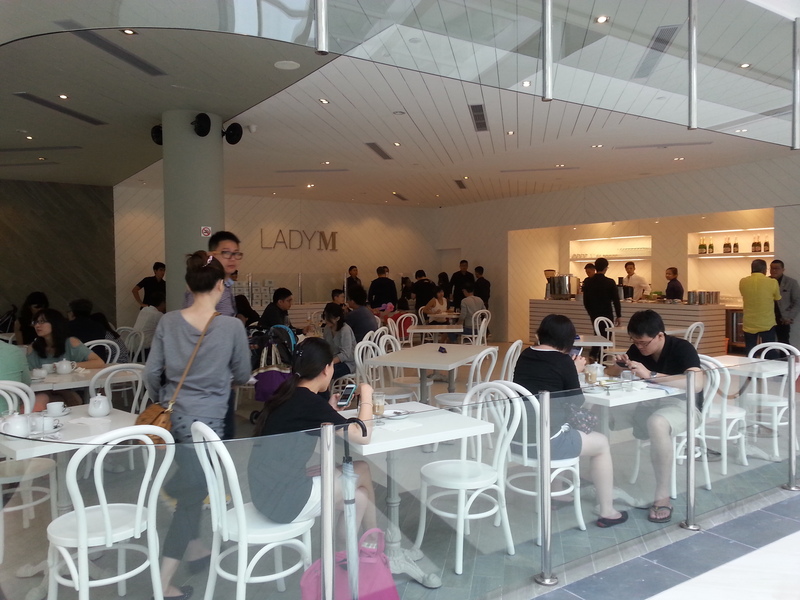 lady m and its amazing sweet treats have finally come to singapore!!! 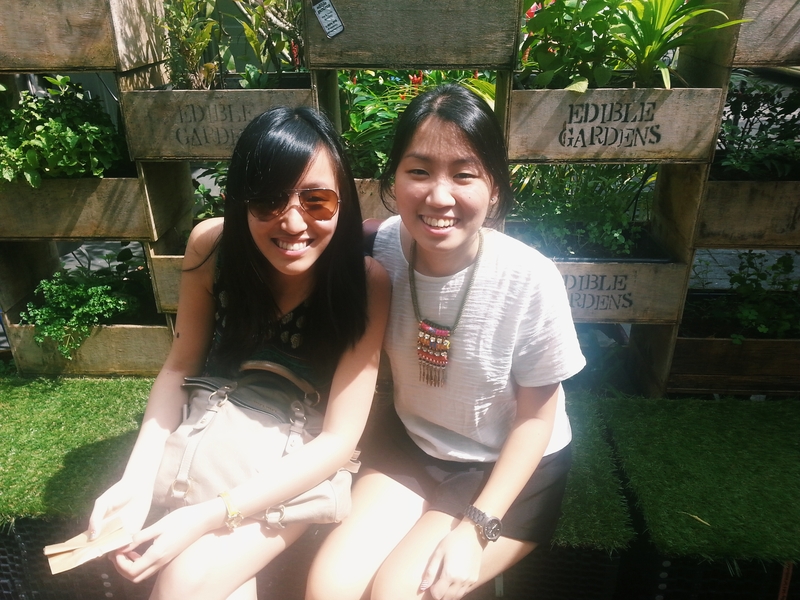 once we read in the papers that they were opening today, the sister and i marked it down in our calendars and headed to marina square as planned this afternoon! the sister fell in love with their cakes when she tried them in new york last year, and very kindly carried a whole cake across the pond from new york to london so the cousins and i could get a taste of their super yummy handmade signature mille crepe. we were really impressed that the cake survived the flight just fine and still tasted as good as ever! 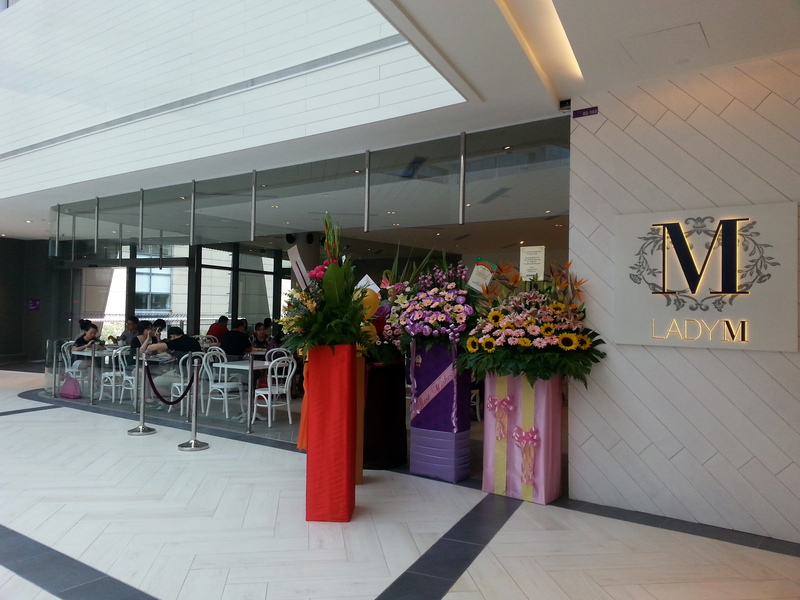 besides their signature mille crepe cakes, lady m also serves a range of other cakes, tarts and pastries that are laid out at the counter for you to take your pick! 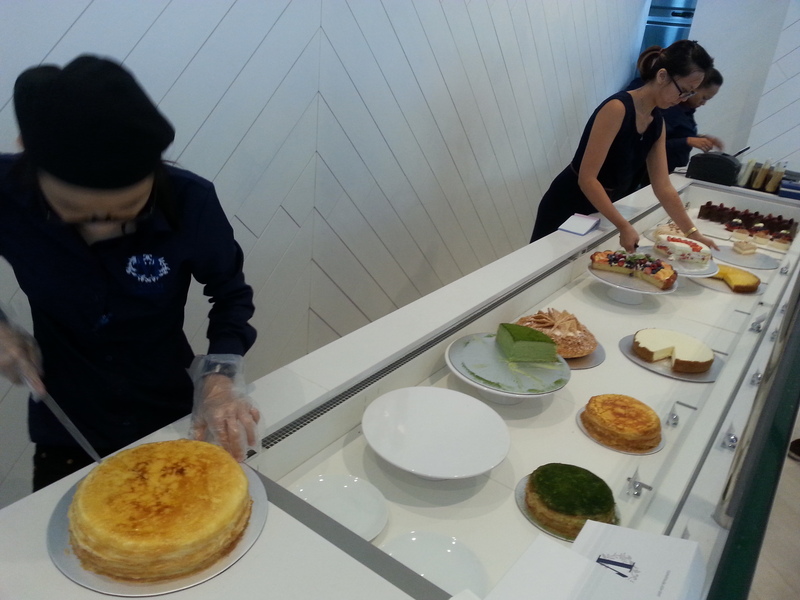 they adopt a minimalist look/approach to the cake display which is very much like that of the outlets in new york, according to the sister. 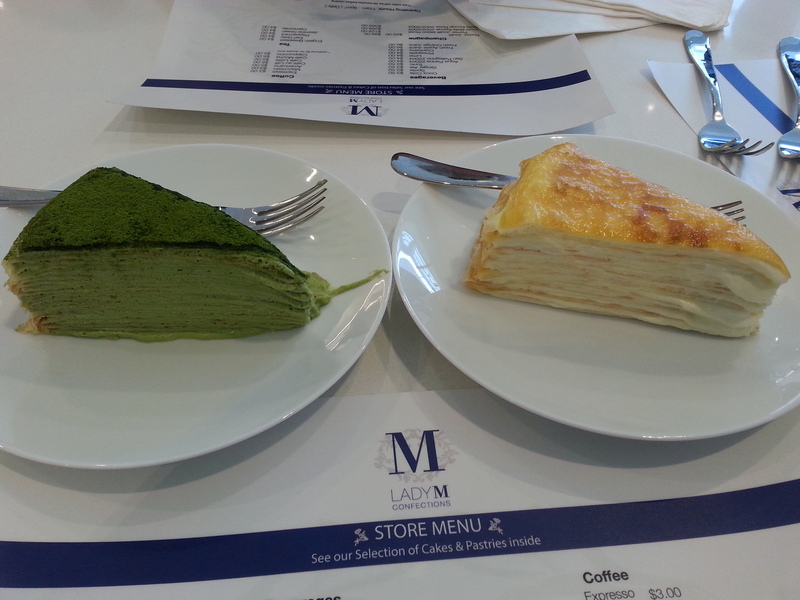 we ordered a slice of their signature mille crepe as well as a slice of their green tea mille crepe at the counter, and they were served to our table rather promptly. considering it was their first day in operation, their service was pretty good and efficient! 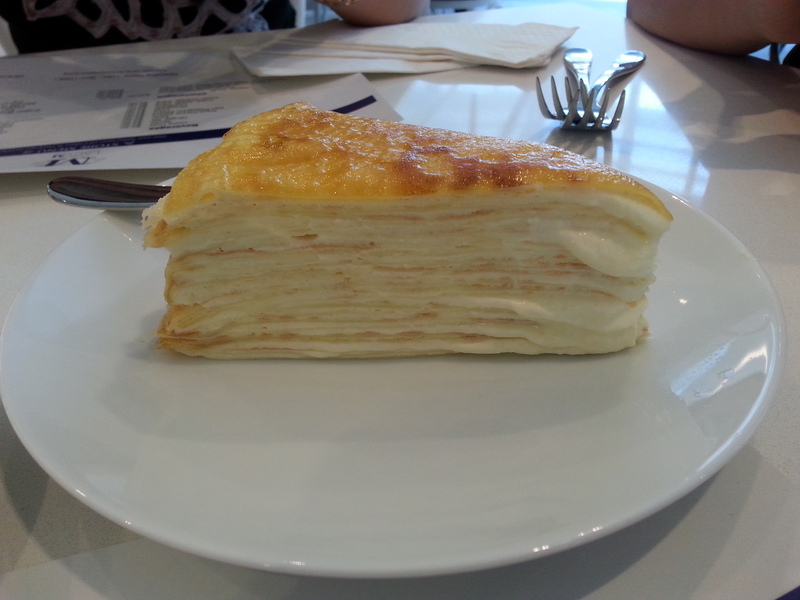 this is lady m’s signature cake which consists of 20 layers of crepe stacked on top of each other, with layers of cream in between. the crepes are handmade and the layers are very thin, which i feel is what sets lady m’s version of the crepe cake apart from others who have tried to make the same thing. the cream is light and layered in just the right amount such that they do not overwhelm the taste and texture of the crepe layers. the top layer is caramelised which gives it a melt-in-your-mouth effect – super yummm. 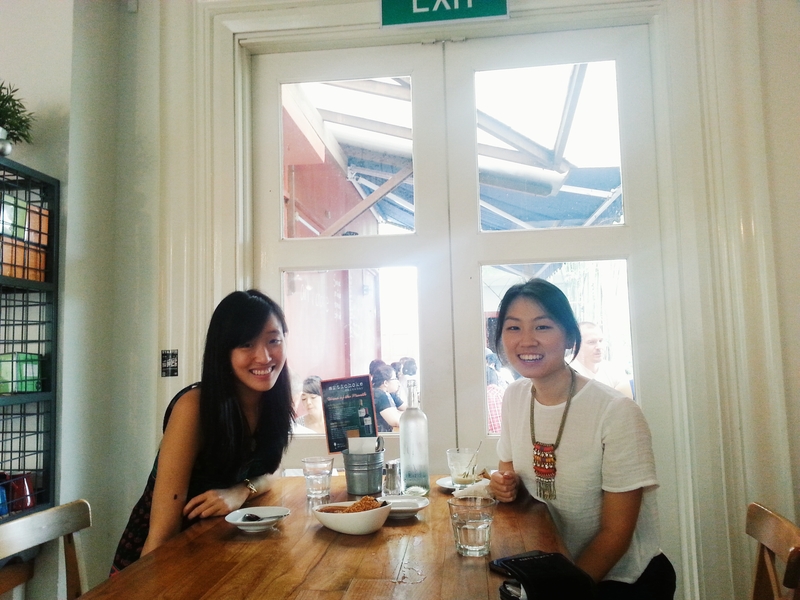 the sister and i agreed that the cream tasted a little different from the new york version though! it seemed to have a cheesecake-type taste while the one we had from the big apple had a more ‘neutral’ taste if you get what i mean – over in the US, it was more like just very light fresh pastry cream. 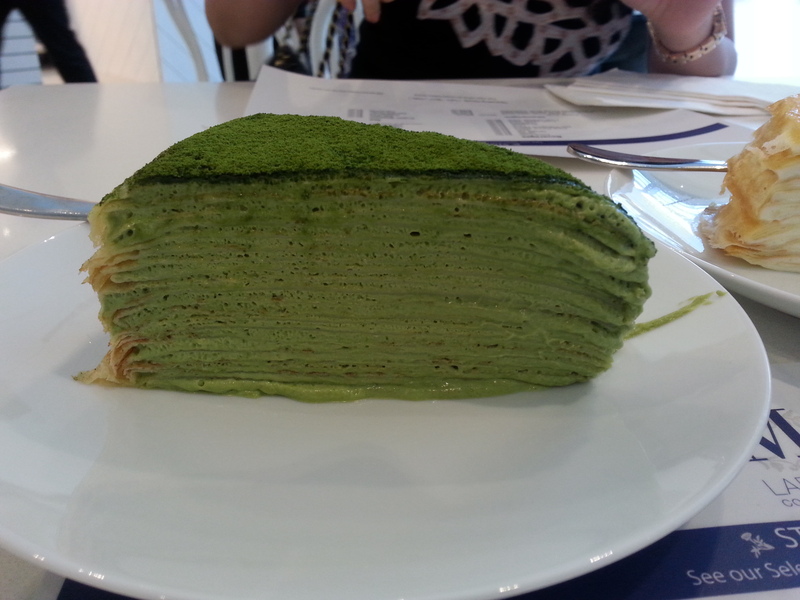 the green tea version of the mille crepe cake – i actually enjoyed this more than the original mille crepe! 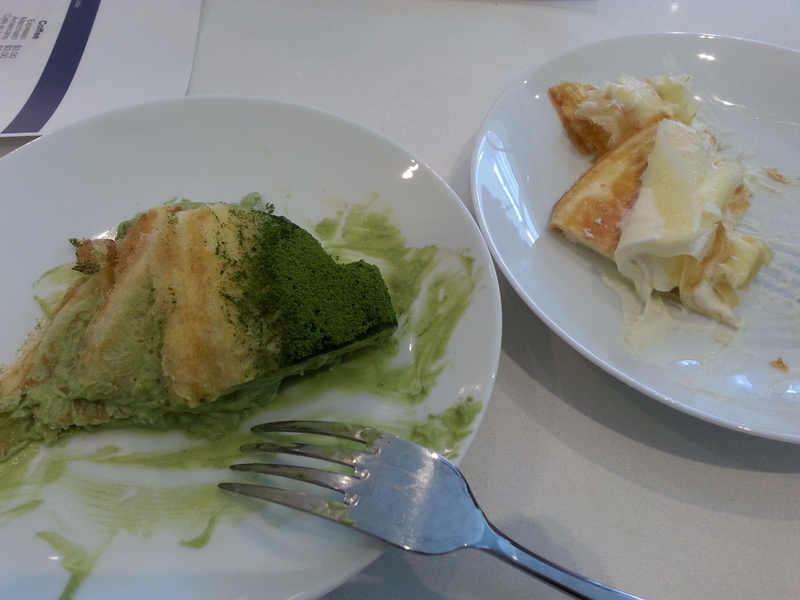 loved the generous serving of green tea powder that topped the slice and the infusion of green tea into every bit of the cake – the taste of matcha was strong yet not overpowering, and the cake was light yet very satisfying. highly recommended to all green tea lovers out there! it being their first day in operation, i suppose unforeseen problems like these are bound to arise. we gave some feedback to the (very friendly and approachable) owner about this, and he told us that they would work on getting the cakes to remain firm for a longer time by leaving them refrigerated overnight and keeping the temperature in the cake display lower. its good to know that they are working on this and hopefully this helps to “acclimatise” the cakes because the sister and i are definitely going to be back for more! the cakes still tasted great and this more than made up for the fact that they lost their shape very quickly. 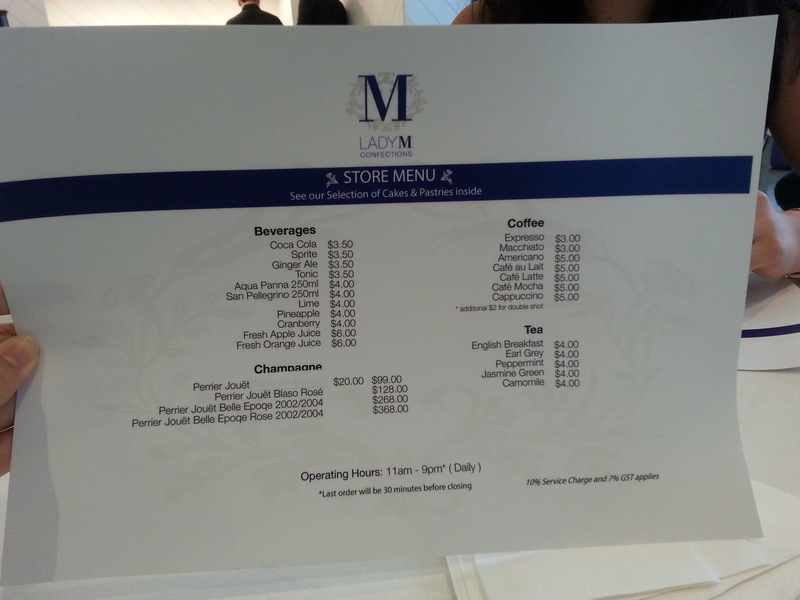 we also like the fact that the cakes and drinks aren’t priced exhorbitantly at all, and the service was good. thumbs up for a first day and here’s hoping that they stick around for a long time to come!